There’s big news from the royal family, as usual. They think that just because they’re rich and powerful, that means they’ve got a patent on the epic tragedy — although to be fair, they usually do. Regular people don’t poison each other and throw themselves off cliffs; they just don’t have the time. So here’s the top headlines: Barnabas, Prince of Collinsport, killed his uncle Jeremiah in a duel. Barnabas was then killed by his own wife, the witch Angelique, and cursed with eternal life. 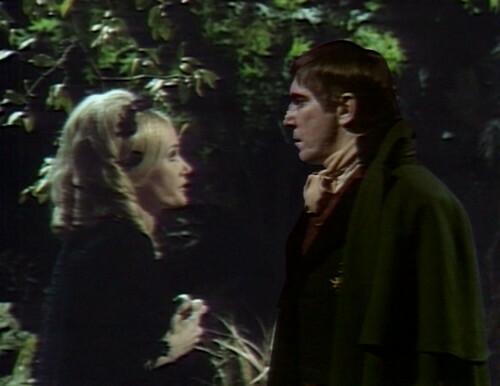 After dispatching Angelique, Barnabas courted his dead uncle’s wife, Josette, and planned to make her his vampire bride. On Friday — confused and frightened by a vision created by the ghost of Angelique — Josette rejected the undead Prince, and killed herself by jumping from the cliff on Widow’s Hill. It’s basically a cross between Hamlet, Macbeth and the juicier episodes of Dynasty, as directed by George Romero. The curtain rises on Act CDXXVI, Scene I: A churchyard. Enter BARNABAS. He walks toward the mausoleum gate. Ben: What’s happened to ya? What’s wrong? Somebody see ya? 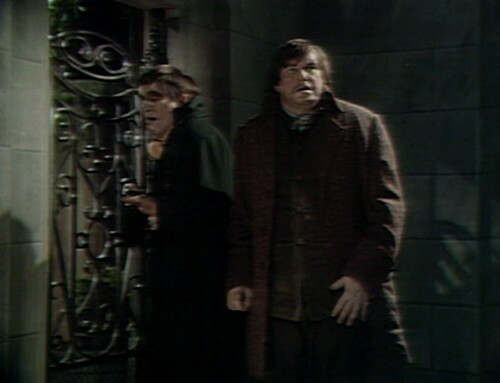 Barnabas shakes his head, enters the mausoleum. Ben follows. Ben: What is it, then? 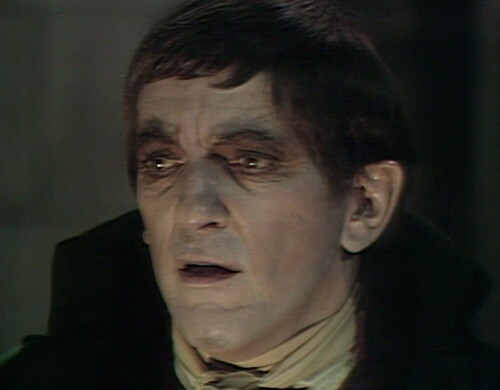 Barnabas sits down on his little sister’s coffin, like it’s a park bench. Barnabas: No. Not me. She’s dead. I couldn’t stop it. Damn, I can’t believe it. Who would want to kill Josette? Apart from you, I mean. Like any character in a Shakespearean tragedy, Barnabas has a monologue for every occasion. 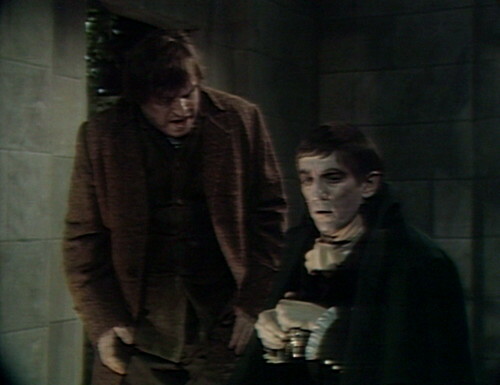 Barnabas: I called to her… She looked at me, frightened. She knew what I had become. She turned… ran from me. She died, hating me. I saw Josette’s crushed body on the rocks below. She is gone from me… and I have eternity without her. Right, because obviously this is all about you. Josette’s crushed body is just another incident in the endless string of anecdotes that you tell to explain the latest reason why you’re acting like a self-absorbed jerk. Determined to end the curse, Barnabas decides to go to his father, reveal himself, and let him take care of the situation. But then he senses that Angelique’s spirit is in the room. 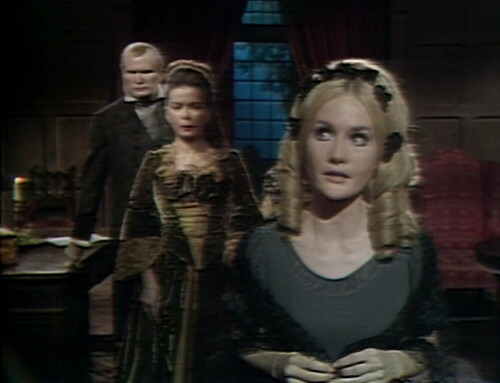 Barnabas: I will end your curse, Angelique! I will find a way to end it. You will kill no one else that I love. Do you hear me? Right on cue, there’s a big thunderclap, which is a heck of a thing to arrange, because it isn’t even raining. You could go a long time between freelance thunderclaps like that. Anyway, he’s not going anywhere. The mausoleum gate swings shut on its own, and the theremin music starts up, confirming that Angelique is in the house. This is our old friend cue 80A, “Angelique’s Spook”, a theremin piece that indicates that witchery is afoot. Then we hear Angelique’s laughter, which has become a regular cart in the show’s sound effects library. We’ve heard it several times over the last couple weeks, in connection with the appearance of Angelique’s floating head, but now it’s started showing up on its own. This is an important development as we transition into the era of Angelique as supervillain, who’s responsible for every bad thing that happens on the show. The canned laugh track means that Angelique gets to take credit for whatever’s happening on screen, without actually paying Lara Parker to show up in the studio. Anyway, it all works out okay, which in this case means that Barnabas gets to do another self-righteous monologue. It’s a Sam Hall script today, by the way, which explains why you’re getting so many quotes. 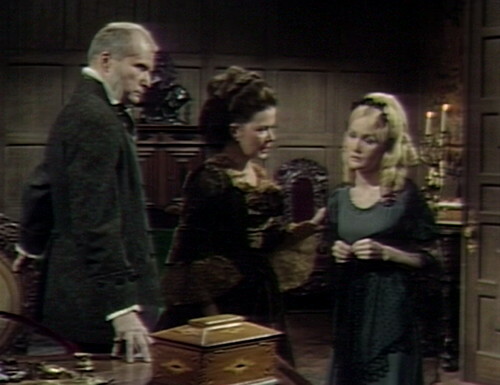 Barnabas: Listen to me, Angelique! You will not let me die, I know. You have robbed me of Josette. Well, I am through loving. Do you hear me? I am through! You need kill no one else. I will never show love for a human being again. Your curse is over! Then he delivers one of my favorite Dark Shadows catchphrases. Barnabas: I am what you have made me, I know, but I will never love again! So GO BACK TO YOUR GRAVE! I love that line. I don’t think that’s a phrase you hear very often on normal TV shows, but on Dark Shadows, it tends to come up. So the gate swings open, Barnabas walks out into the night, and we cut to Scene II, which is even better. Joshua and Naomi are having an emotional conversation about all of the tragedy they’ve endured — losing Sarah and Barnabas, and now Josette. And then: enter Millicent, with black flowers twined in her hair. She recently discovered that her handsome, attentive fiancé, Lieutenant Nathan Forbes, was already married, and had been lying to her the whole time. She’s taking it pretty hard. Millicent: Indeed. 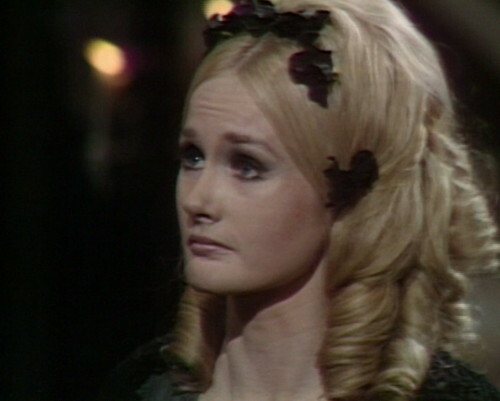 Well, at least she died loving Barnabas. Millicent: I should like my last thoughts to be filled with love, not hate. I have heard that death is often less frightening than life. Joshua: You may be right. Poor Josette had very little to look forward to. Millicent: Until Cousin Barnabas returned from England. And who knows what he would return as? Men change. And seldom for the better. She does this the whole episode. Millicent is hilarious, one of the all-time best characters on the show. Naomi: What a harsh attitude. Millicent: I have no attitude. Just — knowledge. Naomi: Millicent, are you feeling well? Millicent: The more one learns, the worse one feels. I did not realize life was like that. But probably it is a well-known fact that no one bothered to tell me. She’s really not processing information about other people anymore; she’s gone into a weird cocoon of madness to protect herself from the pain of losing Nathan. The funny thing is that this is how everybody else has been treating Millicent the whole time — paying no attention to her problems, because they’re too wrapped up in their own Shakespearean schemes. This has happened several times — Millicent is outside late at night with Nathan and no chaperone, and somebody approaches them. Millicent cries, “I am RUINED!” and starts to make excuses, but the other person completely ignores what she’s saying, and asks if she’s seen Josette. Rosencrantz and Guildenstern had a year-long run on Broadway, starting in October 1967. The Dark Shadows production was made up of New York theater people — and by now, four months into Rosencrantz’s run, I’m sure that Sam Hall was familiar with the play. So I think this whole B-story has been set up specifically to make this joke — that Millicent and Nathan have been doing their own comedy Rosencrantz B-story, just on the fringes of the tragic melodrama unfolding in the next room. I’ve been noticing this for several weeks, and the clincher is the flowers in Millicent’s hair. This is clearly a reference to Ophelia, Hamlet’s fiancée, who goes mad after Hamlet rejects her and tells her to go to a nunnery. The standard costume at that point is flowers entwined in Ophelia’s hair. Millicent showing up with flowers in her hair today says that this correspondence was intentional, a theater in-joke for whoever picks up on it. Hall is aware that they’re doing a comedy version of Hamlet, on the margins of the main storyline. That’s pretty much it, as far as the insights go. That’s all I’ve got. The rest of today’s post is just going to be more Millicent quotes, because this is her best episode, and I love her. Naomi: Where are you going, child? Millicent: I love the night. The darkness lets you see only what you want. You need see nothing ugly unless you choose. Naomi: But it’s not safe! Millicent: Oh, I’m perfectly safe. I have discovered that. And then she just drifts out of the house, into the night. She makes a beeline for the Eagle Hill cemetery, which used to be five miles away, but is now an easy walk from Collinwood. At the cemetery, Prince Hamlet is still walking around and talking to gravestones. If he could find a skull lying around, you can bet he’d be saying “Alas, poor Yorick” by now. It’s a tragic Prince thing. 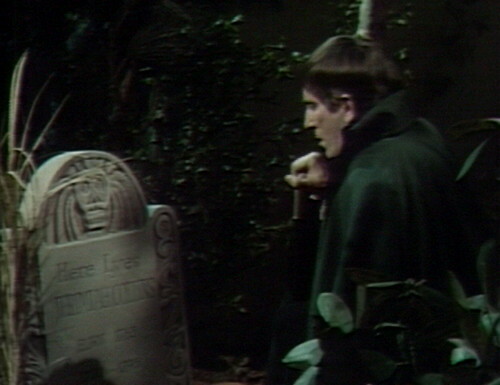 Millicent runs straight into Barnabas, because he’s decided to station himself smack in the middle of the path to the Collins family mausoleum. Everybody thinks that he’s dead, or on a ship bound for England, but he’s not good at keeping secrets. Millicent is delighted to see him, but when she turns away for a moment, he vanishes, courtesy of an almost but not quite successful Chromakey effect. Ben is still hanging around in the graveyard too, and he tries to shoo Millicent away. But you can’t tell Millicent Collins anything today. She just takes over the scene, and there’s nothing you can do about it. Ben: Miss Collins, I’m gonna take you back to Collinwood. Millicent: No. Not yet. I have not done what I came to do. Millicent: Choose my final resting place. Will you show me the mausoleum? And then she just walks into the family crypt, followed by Ben, who has no idea what to do with this crazy girl. Millicent looks around, like a prospective tenant. Millicent: Not what I would have chosen. But then I can’t think what would be ideal. She looks at Sarah’s grave marker. Millicent: Beside Sarah… Yes! I shall be here. She lived so little. But I only a little more. So it is fitting that we should lay side by side, throughout eternity. Millicent: You will remember that this is the one I’ve chosen, will you not? Millicent: And you will see that today’s date is put on. Because today is the day I die. Millicent: And this is the day I want to be remembered, no matter how long I may live. I died this day. And may Nathan Forbes know that I consider this the date of my death! Millicent: Oh, it does not matter. Barnabas will. He understands what it is like to have to stop loving. 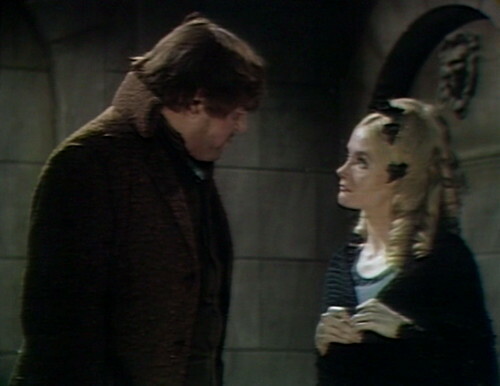 Ben tries to tell her that she didn’t really see Barnabas — maybe it was her imagination, or a spirit. She starts to get upset. Millicent: You do not want me to know that he is back. But why? I had always thought you loyal. Though that is a word I vowed never to use again. I should have known you were not. You are a man. Ben: Miss Collins… I’ll take ya home. Don’t say anything tonight. I’ll find ya tomorrow, and I’ll let ya know if he’s here or not. Millicent: Why would you tell me what I already know? Has my reputation for gullibility gotten even to you? Oh, the shame of it! Ben: I don’t know what you’re talking about. 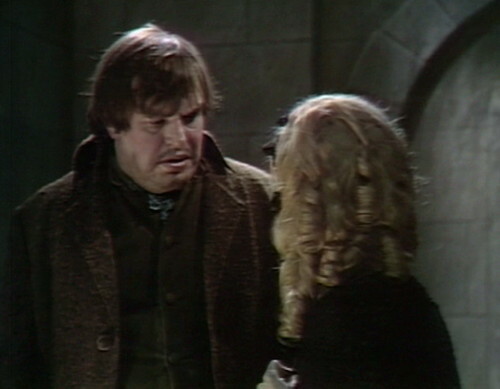 I just know that — Mr. Barnabas, if it was him, he wouldn’t have run away from ya. Millicent: Unless… he thought I was a ghost. Which is quite possible. Her tour of the premises finished, Millicent makes for the door. Millicent: You look feverish to me. It was kind of you to show me the mausoleum, but it is quite damp here, and it may affect your health. I would suggest that you follow me home… at a respectable distance, of course. Good night, Ben. And then she walks away. It’s phenomenal. Ten points for Team Rosencrantz today, no contest. Tomorrow: Disorder in the Court. At the beginning of the teaser, just before Ben says, “Who’s there?” you can hear somebody off-screen turning a page of the script. They’re still using Jeremiah’s gravestone, which says “Jerimiah”. Yeah, Millicent’s not bouncing back from this shock very well. But we’ve seen her as fairly brittle the whole time. It seems like she’s been sheltered; she talks about her banker and broker as if they’re her parents. I interpret her hypochondria as the result of being told to stay indoors and away from people, because otherwise she’ll go out and spend her capital. Even sensible young people can get depressed when their first love affair doesn’t work out. After my first breakup, I said and did ridiculous things. Ophelia-flowers aside, I think Millicent can bounce back from this, if she’s given some time to recover. Unfortunately, this is Dark Shadows, and there are always terrible things just around the corner. As an aside, I believe – and feel free to correct me anyone – that in Bram Stoker’s Dracula novel the Count did go through several changes in appearance. I think at the beginning of the novel he looks fairly old but by the time he reaches England he has a younger and more vital appearance. This aspect has been used in several film adaptations – not sure if a specific reason was given but might have something to do with hunger and lack of nourishment. 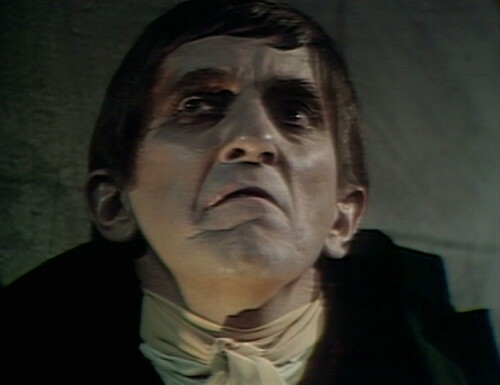 Don’t know if this is what DS was going for but could explain Barnabas’ tired look – maybe he’s fasting as a result of Josette’s suicide? 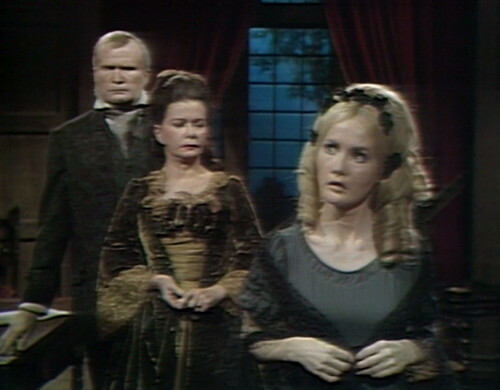 They’ve been showing Barnabas’ appearance changing the whole time. Even in the early days, he’s had scary dark circles under his eyes for the big “vampire” scenes, but then he looks perfectly normal when he’s in his “friendly cousin from England” mode. I think the makeup is more representative of his internal emotional state rather than a literal, observable change. 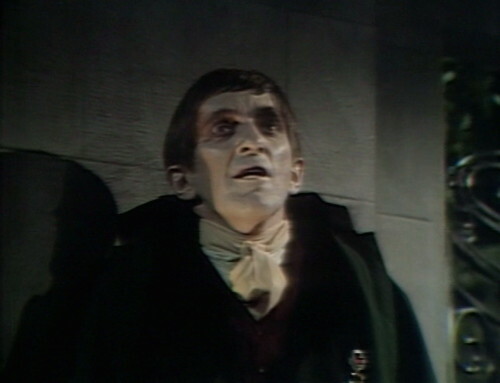 I just attributed Barnabas’ “sick” appearance to maybe he hadn’t been “feeding” since Josette’s death. Even vampires can get depressed, I’d think, and you tend to not take the best care of yourself when you’re seriously depressed – like losing a loved one. Anyway, my kudos to the DS makeup man (can’t think of the guy’s name offhand). He did not ever realized how annoying that was. Absolutely true – I guess I’m seeing this from a more cynical point of view now and should ‘go back in time’ approximately 30 years to remember how devastating a first breakup could actually be. I think later on in the story Millicent does come back to her senses enough to try and protect her fortune by leaving it all to Daniel in her will. I don’t think Millicent came back to her senses and tried to protect her fortune when she left it all to Daniel. She was trying to make a point that Nathan was not marrying her for her money…because now she had no money! Only, unfortunately (and most curiously…), she neglected to tell Nathan what she had done until AFTER she married him. But we’re a few weeks away from that yet, and I’m sure Danny will have fun with that storyline when we get there! I think Nancy Barrett does an amazing job playing millicent. Fragile, sheltered, disillusioned, haughty. I LOVE♥ her. What did she ever see in David Ford? True, i liked her character too. David Ford was mischievous. I’ll bet he made Nancy laugh. He had a manner that makes me think of him as a poor man’s Orson Welles. another blooper is the camera in the cemetery goes to thayer/ben too soon, right before he meets up with millicent. he’s standing there waiting for his cue. Certainly, Millicent’s scene with Peter at the front door, ending in that maniacal laughter, is also amongst the best of. I wasn’t a fan of Millicent at first, but I was won over with this episode. Joshua and Naomi had two children. Both died childless. Joshua had a brother, Jeremiah, who also died without issue. So, who did the Collins descendants in the 1960s descend from? Is that ever explained? They are descendants of Daniel, Millicent’s brother. It gets covered near the end of 1795.